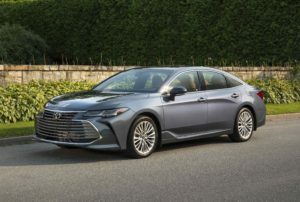 Given the SUV craze that has manifested itself on North American roads, it’s refreshing to see automakers up their game in the luxury cruising sedan market as Toyota has with the 2019 Avalon. Long, low-slung and lovely were the words that came to mind when I first laid eyes on the Harbour Grey Metallic Avalon. From the side, this sedan makes its size felt. Its length compares to that of mid-size SUVs, a fact that becomes obvious when you angle park the car in a parking lot. There isn’t much room left in the spot, front or rear. The lines along the doors and quarter panels combine with steeply raked windows fore and aft to create a sleek impression. A massive grill takes up just about the entire front end of the car, grudgingly allowing space for headlights and not much else. Its don’t mess-with-me vibe gives way to a gently curving hood. The taillights take design cues from the CH-R, forming wing-like protrusions that extend from the trunk lid. The overall look is one of edgy elegance. Sumptuous cognac-coloured aniline leather covers the seats and accents the centre console, heated steering wheel, doors and dash. In the latter places it shares space with dark wood accents. Asymmetrically performated leather seats offer heating and cooling in front, heating only in back. They are fantastically comfortable but for one thing: headroom. I’m 6’5” and I’d love to be able to sit in this vehicle without my hair being jammed against the ceiling. That might have happened had the Avalon not sported the seemingly obligatory but headspace-robbing moonroof. The centre console rises on two subtly shaded stalks. The structure reminds me of a road sign posted on two poles, if the poles were futuristic-looking and melded with the sign to appear as one whole unit that would not look out of place on the set of “Star Trek.” The “sign” part of the unit holds the 10” display and climate controls, separated by two centre vents. 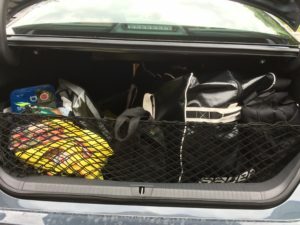 The bag squeezes into the trunk longitudinally and appears to leave enough room for a similarly-sized bag beside it. Sticks poked through the 40-60 split-folding rear seat. The standard Entune 3.0 infotainment interface puts everyday features within a tap or three of the 9” display’s main menu. 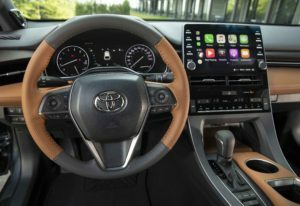 The interface handles a comprehensive set of features (think of one and Entune probably offers it), and gives way to Apple CarPlay if that’s what you want. Audio goes through a 14-speaker JBL audio system with ClariFy Technology. An instrument cluster display works with a heads-up display to help drivers keep their eyes focused ahead of them. Padded leather covers a compartment at the base of the centre console. That little box conceals a Qi wireless charging cubby for phones. Four USB ports in the vehicle ought to keep everybody’s devices topped up. The 3.5L V6 generates up to 301 horsepower and 267 lb- ft of torque. The engine and other components are part of the Toyota New Global Architecture (TNGA). Power goes to the front wheels via a new 8-speed Direct Shift automatic transmission, also part of TNGA. Thank you, Toyota, for foregoing the paddle shifters. This luxurious car doesn’t need them. Drivers who want them, though, can consider the Avalon XSE model. The highway is this car’s natural element. It quietly produces ample power, soaks up bumps and otherwise coddles its occupants. Toyota’s dynamic radar cruise control offers one of the most civilized “automated” drives of any automaker I’ve tested. While some systems are overly eager to accelerate when the lane opens up ahead, the Avalon takes its time. Starts from a stop are reasonably smooth. It also offers quick reaction time when another driver, treating other vehicles like moving pylons, nips in front. Note: while the system is excellent, neither I nor any automaker would ever suggest you let down your guard with the system engaged. Parking a car this big might seem challenging, but with Toyota’s “bird’s-eye” 360-degree camera view, I found I could place the car precisely in the middle of any spot I chose. Toyota puts its Safety Sense package of active safety fetures in more of its vehicles. 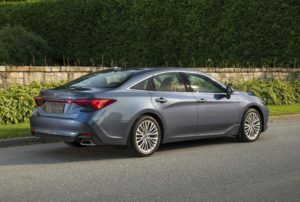 Notable technologies on the Avalon include: Pre-Collision System with Pedestrian Detection function, Lane Departure Alert with Steering Assist function, Automatic High Beams, and the six active technologies of the Toyota Star Safety System. During my week with the Avalon, the car’s fuel economy meter told me I managed about 9.9 L/100km in combined city and highway driving. (This is a 3.5L V6, after all.) The vehicle could benefit from start/stop engine technology to keep it from running when at a red light, stop sign, or otherwise idling. If you drive an Avalon, comfortable cruising will be the order of the day. This Toyota pampers its occupants with a smoth ride, comfortable and well-appointed cabin and all the modern conveniences. 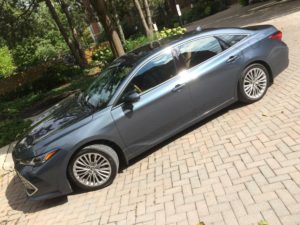 The 2019 Toyota Avalon Limited I drove retails for $49,662.50 MSRP. The base model Avalon starts at $42,790.